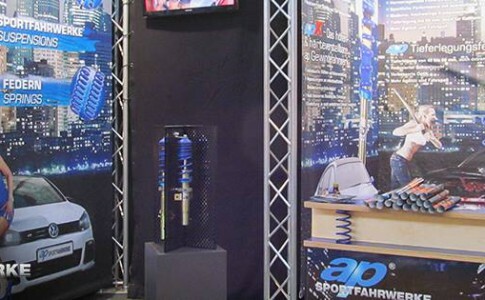 The ap-girl-photoshoot is our annual top-event, together with the tuning-community in Germany. After countless applications and a casting-process over many month, we were finally ready for a adrenalized weekend, full of cool cars and hot girls. 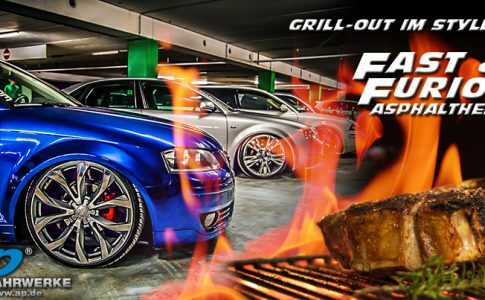 As a part of this event, we would like to introduce you to 9 different cars who have two things in common. They all have been an essential part of the photoshoot and they all are equipped with an ap-suspension. That is reason enough for us, to ask all the drivers some questions. Today, I am here with my 1985 Volkswagen Golf II. It is well known in the german car-scene as „Brownie“. 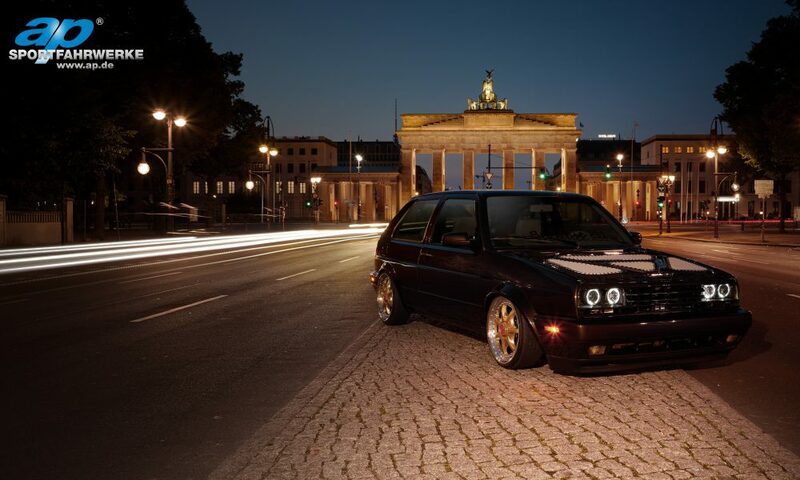 Why did you choose a Golf II? My dad used do drive Golf and my first car was a Golf also. So, its basically „just my car“ since I was a child. Of course, I like cars of the VAG company in general and „Brownie“ is my project now for about 7 years. Well, maybe I should say „our“ project, because my whole family is involved in it. I can see at the first sight, that there is a lot of money and work involved in your car. So tell us some about the looks of the car! The paintjob is done in „teak-brown“, a color of the Audi R8. It also has Pinstripes. The tailgate is cleaned and changed to US look. The wheel-arch is in the G60 wide-body look (3cm more wide), front and rear bumper are equipped with E39 limiting-lights. Porsche doorhandles, one-arm wiper, Rallye front with Corrado angle-eye lights and spoiler, backlights in clear and red, Golf IV mirrors, lock-covers cleaned and painted in a bright ivory, engine-bay cleaned and painted in bright ivory, hood without the outer-skin and with leather in the openings, some chrome-parts as locks and others, gas-cap with leather, petrol-cap-cover painted in beige, bumpers in GT-look and front bumper is also cleaned. It has BBS RT Typ 077 rims from BMW in 7,5×17 et40 LK 5×120 in gold and black, wheel bolts in chrome, hub-cover in gold with a red and golden BBS emblem and it has 185/35R17 tires. Wow, thats a lot of stuff. How about under the hood? It is a R32 rebuild. It started with a 90 hp engine and now its a G60 engine from 1985. Engine and gearbox are painted in black. CDA Airbox in leather, lots of small parts are built by myself like the channel flow. Most parts are either painted or power coated. Light Flywheel, Sachs Sport clutch, 5-speed VR6 CCM gearbox, optimized controller, launch-control, frequency-converter for the Golf 2 speedometer, engine cover with leather, exhaust-temperatur-sensor, wideband-lamda-sensor and some more. The car also comes with a Monster exhaust from Pogea Racing, metal-catalyst and mainfold. All in all the car has an output of 300 hp, now and it also has an ap-Sportfahrwerke coilover-kit and the breaks of a Porsche 996. It has a beige and black leather trim which is from the VW Corrado. Dashboard is in beige leather and it has some stitching on it. Some other interior parts are also come with beige leather, like the Audi R8 steering wheel, the Wiechers roll-bar and the car-headliners are in black Alacantara with beige seams. A Wiechers strut braces is in the front and the back. Inside mirror and sun-visor in beige leather with stitching. Doormats in black Alcantara with R32 logo and a beige leather edge. The inside of the trunk is all in beige/black leather. Pedals from Golf R32, complete E-package and some car-audio is also on board. Audiovox DVD moniceiver, Eton power-amp and Massive Audio N2 power-amp, 30 Hertz subwoofer, ESX frontsystem and monitors in the trunk. That is really a lot of stuff! You changed pretty much everything on that car, didn`t you? So to say! Not to mention our little bobby-car for our daughter Bea. It also has some tuning and matches our „big“ Brownie. That is a lot of work. Do you have time for some car-life left? Of course! The whole family is on the road pretty much every weekend in summer on different car events. I am in the car scene for so many years now, and in the meantime I just love to do it together with my family. I think „camber“ has some future in the tuning-scene. Of course there are things I like more and some I like less but I think, everybody has his own taste.